TRA Rebel guard Blain Curtis drives through an USJ double-team during fourth quarter action Friday night in TRA’s 51-42 win. Rebel power forward Matt Moody led his team in scoring Friday night. TRA’s win over USJ in the TRA Gymnasium put the Rebels in second place in their league’s standing behind St. George’s. Jason Morgan had a strong feeling about his Tipton-Rosemark Academy Rebels back in late October. The veteran Coach admitted his team endured some tough defeats in 2012-13. But Morgan declared those rough moments would pay off in league wins in January. Morgan started to look like a prophet after his team beat Fayette Academy Jan. 14 in the TRA Gymnasium. The Rebels didn’t have too long to enjoy the benchmark victory with the ranked USJ Bruins coming to town. The mature and seasoned Rebels were ready for that challenge holding off the Bruins down the stretch for a 51-42 win. In the fourth quarter Moody scored 8 points and teammates like fellow seniors Connor Alexander and Austin Chambers made big plays. 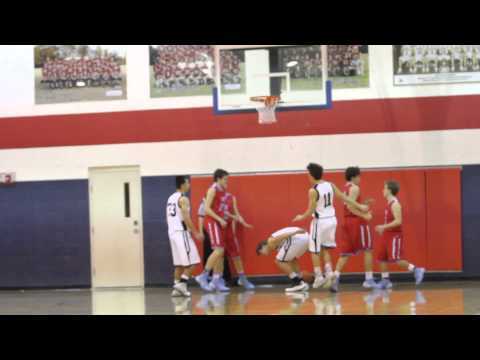 Alexander broke USJ’s press multiple times along with sophomore guard Johnie Sanfratello. And Chambers made several big defensive plays including taking a charge when the Bruins were trying to chip into a 42-36 deficit. Leading up the clutch fourth quarter, the Rebels jumped out to an 11-7 advantage after one quarter. The opening period concluded with a Moody one-hand slam. And TRA was ahead 18-14 in the second quarter after Chambers drained a triple. Then the Bruins closed out the first half on a 10-3 run to lead 24-21 at halftime. With USJ ahead 26-21 in the third quarter, Moody made sure the Bruins wouldn’t pull away with his first three-point play in the period. Moody’s second three-point play made the score 28-27. Alexander gave the Rebels the lead with a one-shot three-pointer. After a pair of foul shots form Alexander, TRA was ahead 32-28. The Rebels continued to build on their advantage when Alexander made a steal and raced toward the other end of the court for a layup. Moody concluded the quarter with his third three-point play. The layup and foul shot made the tally 37-28 heading into the fourth quarter. TRA went ahead 40-30 when Moody stepped outside and drained a three-pointer. USJ cut the deficit in half with a 5-0 spurt. Moody stopped the Bruins momentum using a spin move in the post for a layup. After a USJ free throw made the score 42-36, Chambers took a charge which swung the momentum fully to TRA. The Rebels were able to outscore USJ 9-6 down the stretch behind clutch free-throw shooting from Sanfratello, Alexander and Moody. Chambers said along with experience, it took heart and desire to pull out a win over a good program like USJ. Moody noted the week has been one of the biggest in program history in a long time. And the Rebels have to build off the positive momentum heading into February.